Choose coral trees to mark Christmas this year and help build the resilience of the Great Barrier Reef through the not-for-profit Reef Restoration Foundation’s Coral Crusaders campaign. Cairns business advisory and consulting firm Fortis One has gifted coral to each of their team of 12 allowing their staff to be among the first generation to adopt coral grown on the World Heritage-listed Great Barrier Reef. Director Elmarie Gebler, who is also a Director of Reef Restoration, said businesses often forgot why they shared gifts with staff and clients. “This is an opportunity to be mindful about how much the Great Barrier Reef gives to our community,” she said. Coral can be adopted for $50, while larger gifts include $500 for a coral branch or $10,000 to tend a coral tree at Australia’s first ocean-based coral nursery at Fitzroy Island near Cairns. Chief Executive Officer Stewart Christie said urgent support was needed to build the Reef’s resilience following the comment by the Great Barrier Reef Marine Park Authority’s (GBRMPA) chief scientist David Wachenfeld that “we must not take our foot off the pedal – we must press it even harder”. “Reef Restoration Foundation has successfully completed the inaugural cycle of harvesting, growing and planting coral on a reef affected by bleaching with the process taking eight months,” Mr Christie said. “The 132 nursery-grown Acropora corals attached to a degraded section of the reef at Fitzroy Island are thriving with the tips of both the branching and bushy species showing hints of colour including blue, pink and purple. 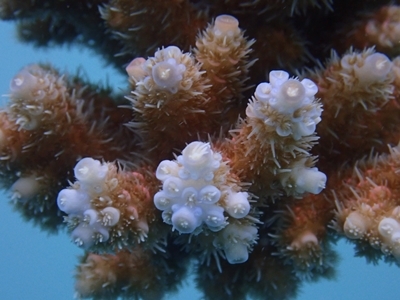 “Similar to plants, coral cuttings are a faster way to grow coral. We started planting these corals late in August and are really happy with their progress over the past three months. “The site has 25 species of fish including yellow mask angelfish, leopard coral trout and lemon damsel swimming among the corals. 800 second generation corals cut from 40 mother colonies. “New pieces of coral will continue to be attached to the nursery’s 10 coral trees with the goal of 1000 pieces before the end of the year. By adopting a coral, your investment will help to grow and plant more coral on the Great Barrier Reef. “Following the success of the pilot nursery, we are in the process of applying for permits to expand the ocean-based nursery program to four high-value reefs off Cairns which would add another 120 coral tree frames to the Great Barrier Reef. The Reef Restoration Foundation pilot ocean-based nursery is monitored by James Cook University’s TropWATER and Reef Ecologic with the support of the Australian Government’s National Environmental Science Program. Become a Coral Crusader at reefrestorationfoundation.org/pages/crusader and follow Reef Restoration Foundation on its journey at www.facebook.com/reefrestorationfoundation/ and www.instagram.com/reef_restoration_foundation.